How Do You Measure a Burn? The rule of nines assesses the percentage of burn and is used to help guide treatment decisions including fluid resuscitation and becomes part of the guidelines to determine transfer to a burn unit. 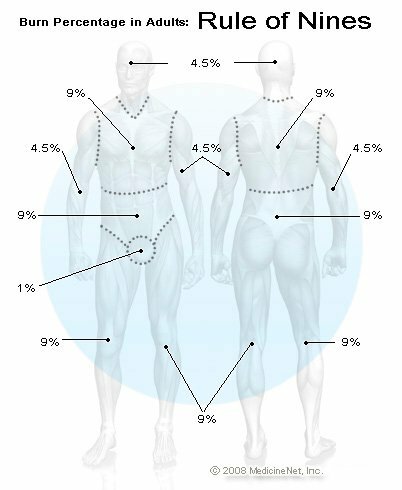 You can estimate the body surface area on an adult that has been burned by using multiples of 9. Consumer e-Tools are not intended to provide professional advice or recommend particular products. Physicians and healthcare professionals should exercise their own clinical judgment when assessing the results of our tools or calculators. Consumers should consult a doctor for advice when assessing the results.